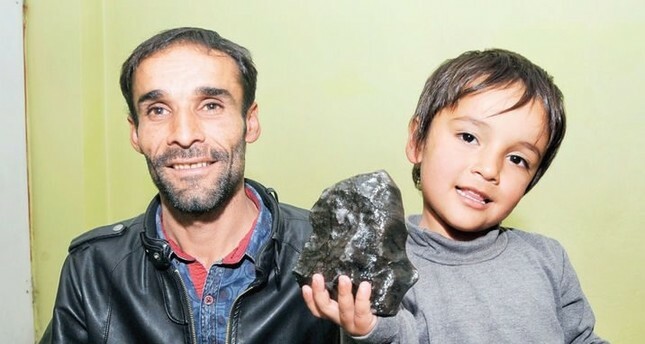 Hasan Beldek poses with his son holding a large meteorite he found in his village Sarıçiçek in this undated photo. Sarıçiçek, a small, sleepy village in eastern Turkey's Bingöl made the headlines in 2015 when meteorites landed on an uninhabited location in the area. Locals collecting the meteorites, which is now confirmed to be part of the asteroid "Vesta," struck it rich by selling them to scientists and collectors, earning over TL 1 million. A new paper by NASA scientists confirms the origin of the asteroid and says the pieces the villagers found were more than 22 million years old. The findings of the research, conducted by 79 scientists, that were published online say Vesta, which was then positioned somewhere between Mars and Jupiter, was hit by an unknown mass that carved out a large crater called Antonia. The collision hurled debris from the asteroid into space and the debris eventually fell near Sarıçiçek. Ozan Ünsalan of Ege University, who was part of the research team, said the rare fragments of the meteorite fell off the southern crater of Vesta. "Along with Peter Jenniskens [from the Search for Extraterrestrial Intelligence (SETI) Institute], we collected 334 samples from Sarıçiçek and sent them to other scientists for analysis. Aided by data from NASA's Dawn spacecraft from orbit, we discovered the fragments fell off from Antonia 22 million years ago," Ünsalan said in a written statement. He said the meteorite was larger before it fell on the village but more than 95 percent of its mass broke off when it entered the atmosphere. "We have a map of asteroids near Earth and meteorite monitoring systems in a large number of Turkish provinces. This is necessary for taking measures in case of an approaching meteorite. We now know how to tackle meteorites that may hit Turkey in the future," he said.